It’s both common sense and a well-documented fact: The longer someone lingers in your store, the more likely they are to make a purchase. Store penetration — driving visitors more deeply and broadly throughout your store — is the name of the game. Penetration encourages lingering. Lingering encourages buying. Sounds simple, right? How can you encourage your customers to extend their stay? Today’s retail analysts and designers use a blend of refreshingly new and surprisingly old tactics to improve store penetration. Here are seven picks from their playbook that could work you, too. Simply put, comfortable temperatures keep customers in your store longer. Air conditioning isn’t new to retail, but it wasn’t a priority at most garden centers. If you can add air conditioning, it’s an advantage. If not, look to improve air circulation. If you can keep a customer shopping just a bit longer, you can produce extra sales on even the hottest days. New greenhouses (and new stores) are often constructed with high ceilings to draw warm air away from the floor. Many owners now opt for roll-up sidewalls to help foster air circulation throughout the selling zone. In older stores with lower ceilings, circulation fans and wider door openings are popular. In greenhouse settings, even the addition of 30 percent shade cloth can significantly lower temperatures, keeping your customers more comfortable and providing your plant material with some relief from heat stress. Choose carefully, though: Shade cloth that’s too dense could adversely reduce light levels for some plant material. Take note of where checkout registers are located in today’s retail footprint. They’ve moved to the middle of the store! The benefits are numerous: increased sightlines for store staff and customers, reduced congestion at entrances and — you guessed it — improved penetration, as customers move deeper into the store’s layout to shop. Long checkout lines and processing times make lasting impressions, but not in a good way. No matter how good your pricing is, long checkout lines with only one or two open registers are a turnoff. Fast service is expected in the age of Amazon Prime, and if you read virtually any restaurant review, service is usually praised or condemned within the first three sentences. Time is important to everyone. You may have noticed that Panera Bread and McDonald’s have remodeled using self-service kiosks to expedite the ordering process. Kiosks have found homes near the deli counter at the grocery store, too! They lessen the perception of long lines while bringing menus closer and reducing eye fatigue for older customers. Garden centers are moving checkouts to the middle of the store. Once you’ve improved the sightlines around your store, you can entice your customers to explore every corner and cranny. Bold visuals and/or bright colors along the perimeter are often very effective. These can come in several forms, including signage or vertical displays of neatly stacked product. Colored perimeter walls also can separate categories and departments, helping the consumer reach their desired location quickly and efficiently. Supermarkets were among the first to use this tactic; it’s been a game-changer for them. Colored perimeter walls separate the pottery department from others. Display lighting supports store penetration in two ways. First, it helps define textures and colors. Use it selectively to accentuate new or high-value products. Second, when used more broadly, it can eliminate shadows inside deep shelf-wall gondolas and fixture cabinets, allowing customers to see the full depth of your displays. For years, lighting was a tricky and expensive venture. It was an electricity hog, driving up utility bills. It generated a lot of heat, sometimes compromising product quality and customer comfort. The incandescent bulbs were both costly and relatively short-lived. Today, many of those challenges are gone. LED lighting offers low heat, improved color, low energy consumption, higher lumens (brightness) and long bulb life. If you’ve been hesitant to try accent lighting, start with some simple LED rope lighting under your gondola shelves. The difference is striking. The optimum distance between gondolas and displays has grown by feet, not just inches! Consumers appreciate the extra room; placing displays too close together can make shoppers feel claustrophobic. Retailers benefit, too, from better sightlines and less visual clutter. To get a sense of how much space we’re talking about, stretch both of your arms outward. That’s the minimum distance you’ll want between gondolas, self-standing displays, gift racks and the like. Similarly, aisle widths have grown from 5 to 6 feet to the supermarket-sized highways of 6 to 8 feet! Aisle widths have grown to 6 to 8 feet. 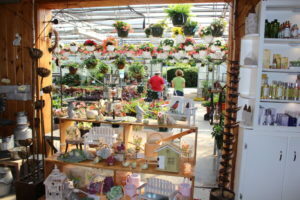 Independent garden centers have a well-deserved reputation for expansive plant selections, customer service and a myriad of solutions for any gardener’s problem. In the face of in-store space constraints, smaller staffs and time-strapped customers, today’s retailers must adapt. Retail experts now advocate a tighter, more focused approach to selling. In the chemistry category, for example, minimize duplicates and streamline your selections with more general-use products (and fewer of them). Doing so reduces confusion and option paralysis for our customers. A simplified approach benefits retailers too. Limiting selection often increases sales and focus on the products that remain. It also reduces inventory and makes re-ordering more efficient. A win-win! Consumers shop first by need. Follow this simple formula for solution-based selling in all departments and categories: Shop by need, by brand, by delivery/type/size —in that order. Within these areas, you may choose a specific brand to promote. Building displays this way helps you define an easier, confusion-free path to purchase for both shoppers and store associates. The solution-based formula also works in the nursery. A favorite example of mine is to group roses by type: heirloom, climber, grandiflora, floribunda, miniature, shrub and hybrid tea. You can choose to group or segregate by brand, such as David Austin and Knockout. Grouping drives sales by need, by brand or by type through easy identification. Some retailers showcase large masses of a single “group by color” to help guide customer preferences. Pottery sales benefit from the “group by color” display technique, too, as it’s the No. 1 criteria by which consumers shop for containers. Every year, we have new products in our expanding world of plant genetics, pottery and professional soils. Plan to show and sell your best combinations together to spark customers’ imaginations and get them excited about what’s possible in and around their homes. Agree or not, today’s brick-and-mortar continues to exist because of the consumer experience. Experiment with these proven retail plays not only to survive, but also to thrive.